The Andy Griffith Show was broadcast on CBS Television from October 1960 to September 1968 (a total of 249 episodes), making it one of the most enduring and influential shows in American television history. The series starred North Carolinian and University of North Carolina graduate Andy Griffith as Sheriff Andy Taylor of Mayberry, a fictional North Carolina town. Mayberry represented the ideal small southern community, where gossip often ran rampant but where the citizens were genuinely concerned about one another. The exact location of Mayberry was never clear, although the real town of Siler City was often referred to as a neighboring community. Another frequently mentioned neighbor was "Mt. Pilot," presumably based on the town of Pilot Mountain, which was in the proximity of Griffith's hometown, Mount Airy (Surry County). The Andy Griffith Show was instantly popular nationally, achieving in its first season Nielsen ratings of first among situation comedies and fourth among all shows. By the final season, the series was number one in the overall ratings. Although much of its success can be attributed to the quality of its writing and the talent of its cast, the Andy Griffith Show also offered viewers a gentle, warmhearted vision of the South that directly countered the real-life turmoil characterizing the region throughout the 1960s. Although its scripts did not deal with issues of race and civil rights overtly, they consistently advocated decency, fairness, justice, humanity, and equality-alternatives to the "dark side" of the South that was so unsettlingly apparent in the unrest, demonstrations, and violence of the era. Most episodes centered on the difficulties and misunderstandings that arose among friends and neighbors in the community. Andy Taylor was a widower raising his young son Opie (Ron Howard), and Bee Taylor (Frances Bavier), his aunt, lived with them. 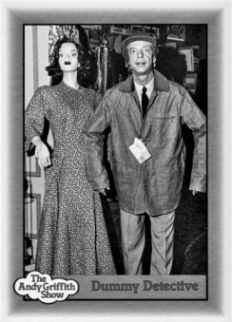 Supporting characters included Deputy Barney Fife (Don Knotts, who earned five Emmy Awards in the role), town drunk Otis Campbell (Hal Smith), barber Floyd Lawson (Howard McNear), gas station attendants Gomer and Goober Pyle (Jim Nabors and George Lindsey), and two of Andy's "sweethearts," drugstore clerk Ellie Walker (Elinor Donahue) and teacher Helen Crump (Anita Corsaut), whom he eventually married. By the end of most episodes, Andy had used his charm and homespun wisdom to settle disturbances in Mayberry and restore its peacefulness and order. 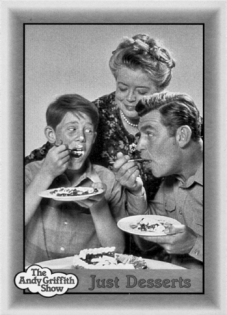 Some episodes revolved around Andy's domestic life; he always worked to build Opie's character and to reassure Aunt Bee of her value to both the community and his household. Other episodes involved Andy's tact in dealing with Barney's incompetence and eccentricities. When Griffith left the series in 1968, it continued for 78 episodes (23 Sept. 1968-6 Sept. 1971) in its Monday time slot as Mayberry R.F.D., with Ken Berry in the principal role as a small-town councilman. Spin-offs included CBS's other rural comedy series, The Beverly Hillbillies, Petticoat Junction, Green Acres, and Gomer Pyle, U.S.M.C. In 1971 CBS-seeking younger, more urban audiences-dropped all southern-oriented series. The Andy Griffith Show was subsequently syndicated as Andy of Mayberry. In April 1986 NBC aired Return to Mayberry, a nostalgic TV movie that reunited most of the original cast of the Andy Griffith Show (with the exception of Frances Bavier, who was ill, and Howard McNear, who had died in 1969). Individual stations throughout the country continued to offer reruns of the Andy Griffith Show, which has remained extremely popular decades after the original series began. Ken Beck and Jim Clark, The Andy Griffith Show Book: From Miracle Salve to Kerosene Cucumbers: The Complete Guide to One of Television's Best-Loved Shows (1995). Richard Michael Kelly, The Andy Griffith Show (rev. ed., 1984). Stephen J. Spignesi, Mayberry, My Hometown: The Ultimate Guidebook to America's Favorite TV Small Town (1991). Andy Griffith receives the North Carolina Award in Find Arts, 1983.